NASA’s two Voyager spacecraft are hurtling through unexplored territory on their road trip beyond our solar system. Along the way, they are measuring the interstellar medium, the mysterious environment between stars. NASA’s Hubble Space Telescope is providing the road map – by measuring the material along the probes’ future trajectories. Even after the Voyagers run out of electrical power and are unable to send back new data, which may happen in about a decade, astronomers can use Hubble observations to characterize the environment of through which these silent ambassadors will glide. A preliminary analysis of the Hubble observations reveals a rich, complex interstellar ecology, containing multiple clouds of hydrogen laced with other elements. Hubble data, combined with the Voyagers, have also provided new insights into how our sun travels through interstellar space. The astronomers hope that the Hubble observations will help them characterize the physical properties of the local interstellar medium. “Ideally, synthesizing these insights with in situ measurements from Voyager would provide an unprecedented overview of the local interstellar environment,” said Hubble team member Julia Zachary of Wesleyan University. The team’s results were presented Jan. 6 at the winter meeting of the American Astronomical Society in Grapevine, Texas. NASA launched the twin Voyager 1 and 2 spacecraft in 1977. Both explored the outer planets Jupiter and Saturn. Voyager 2 went on to visit Uranus and Neptune. The pioneering Voyager spacecraft are currently exploring the outermost edge of the sun’s domain . Voyager 1 is now zooming through interstellar space, the region between the stars that is filled with gas, dust, and material recycled from dying stars. Voyager 1 is 13 billion miles from Earth, making it the farthest human-made object ever built. In about 40,000 years, after the spacecraft will no longer be operational and will not be able to gather new data, it will pass within 1.6 light-years of the star Gliese 445, in the constellation Camelopardalis. Its twin, Voyager 2, is 10.5 billion miles from Earth, and will pass 1.7 light-years from the star Ross 248 in about 40,000 years. 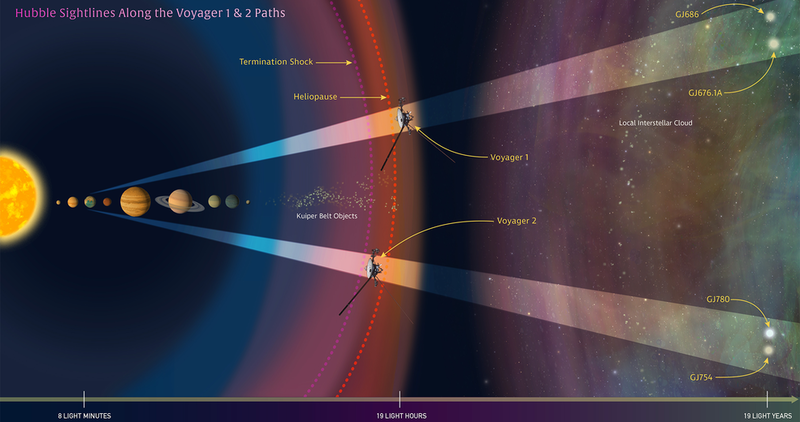 For the next 10 years, the Voyagers will be making measurements of interstellar material, magnetic fields and cosmic rays along their trajectories. Hubble complements the Voyagers’ observations by gazing at two sight lines along each spacecraft’s path to map interstellar structure along their star-bound routes. Each sight line stretched several light-years to nearby stars. Sampling the light from those stars, Hubble’s Space Telescope Imaging Spectrograph measures how interstellar material absorbs some of the starlight, leaving telltale spectral fingerprints. Hubble found that Voyager 2 will move out of the interstellar cloud that surrounds the solar system in a couple thousand years. The astronomers, based on Hubble data, predict that the spacecraft will spend 90,000 years in a second cloud and pass into a third interstellar cloud. An inventory of the clouds’ composition reveals slight variations in the abundances of the chemical elements contained in the structures. “These variations could mean the clouds formed in different ways, or from different areas, and then came together,” Redfield said. An initial look at the Hubble data also suggests that the sun is passing through clumpier material in nearby space, which may affect the heliosphere, the large bubble containing our solar system that is produced by our sun’s powerful solar wind. At its boundary, called the heliopause, the solar wind pushes outward against the interstellar medium. Hubble and Voyager 1 made measurements of the interstellar environment beyond this boundary, where the wind comes from stars other than our sun. The heliosphere is compressed when the sun moves through dense material, but it expands back out when the star passes through low-density matter. This expansion and contraction is caused by the interaction between the outward pressure of the stellar wind, composed of a stream of charged particles, and the pressure of the interstellar material surrounding a star. The Hubble Space Telescope is a project of international cooperation between NASA and the European Space Agency. NASA's Goddard Space Flight Center in Greenbelt, Maryland, manages the telescope. The Space Telescope Science Institute (STScI) in Baltimore, Maryland, conducts Hubble science operations. STScI is operated for NASA by the Association of Universities for Research in Astronomy in Washington, D.C. The Voyagers were built by JPL, which continues to operate both spacecraft. JPL is a division of Caltech.